Meet Dr. Alexander Chen, O.D. Dr. Alexander Chen, O.D. is a therapeutic optometrist and optometric glaucoma specialist who practices full-scope family eye care in the Fall Creek area. A native Houstonian, Dr. Chen graduated from The University of Texas at Austin with a Bachelor of Liberal Arts degree in Economics in 2005. He went on to earn his Doctor of Optometry degree in 2009 from the University of Houston College of Optometry. While in optometry school, Dr. Chen served the optometric student body as the President of the Optometric Student Association and was actively involved in several student organizations. He earned multiple scholarship and leadership awards, including Outstanding Student of the Year for three consecutive years and the Dr. Nelson Reber Open Eye Leadership Award. He was also inducted into the Golden Key International Honor Society. Dr. Chen served the U.S. Army and its veterans as a student-doctor while completing internships at Fort Sam Houston and the Albuquerque Veterans Affairs Hospital. 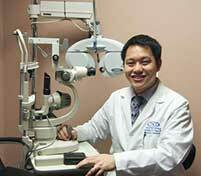 Upon graduation, Dr. Chen became an associate doctor at the Texas State Optical offices in Humble and The Woodlands. He is excited to have the opportunity to start his own practice and hopes you will let him be your next comprehensive eye care provider. When Dr. Chen is not serving the community as an eye doctor, he enjoys being actively involved in church, spending time with family and friends, playing sports, and watching movies.